Monster Truck Rally - Dirt Included! Using friction powered engines on the 2 monster trucks, you can build ramps and dirt mounds and obstacles to trample on top of the play mat. The dirt is like no dirt you've ever seen. It's moldable, pliable, and easy to clean up. 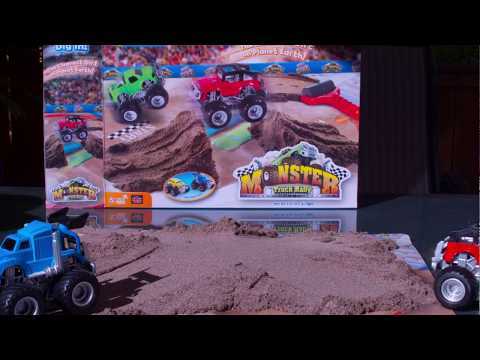 With 2 pounds of it, you'll be able to build a full monster truck rally set on the full color play mat using the road roller to mash the dirt into shape. Using the trucks and molding the dirt helps build fine motor skills, encourage hand-eye coordination development and facilitate creativity! Bring the reality of a fierce, rough-and-tumble monster truck rally into your home in a safe, clean way! Size: 12.75" x 10.5" x 2.5"